The 1800s were a big time for English voyagers to travel the world and then write up their adventures. Mansfield Parkyns went to Abyssinia (nowadays Ethiopia and Eritrea) when he was 20 and lived there for 3 years. While in Abyssinia, he adopted their dress and customs. That included going barefoot. Here are some selections from his book, Life in Abyssinia. He started off wearing sandals. But somehow, they just didn’t quite work out right. The road, as we advanced, became more and more rough and difficult, till at last we found ourselves ascending and descending almost perpendicular hills, covered with large, round, loose pebbles, and well garnished with the usual proportion of thorny trees, neither of which, as may be imagined, contributed to the comfort of a barefooted pedestrian in one of the hottest climates in the world. I had up to this time so far retained old habits as to wear sandals; but even sandals proved inconvenient on exchanging the sandy plain for the stony hills; for, far from protecting my feet, they were the cause of my getting several ugly knocks, by tripping me up and making me slip: so, following the advice and example of my companions, I took them off and carried them in my hands. Before my feet got well hardened I suffered considerably, though not so much as I expected, for the use of sandals is a good preparation for going barefoot, as a great deal of sand gets between them and the foot. I had also been accustomed to go barefoot in moist and deep sandy places, as well as in the house; and was, therefore, not altogether so new at it as if I had constantly worn shoes and stockings. These may be examples of his companions who urged him to go barefoot. 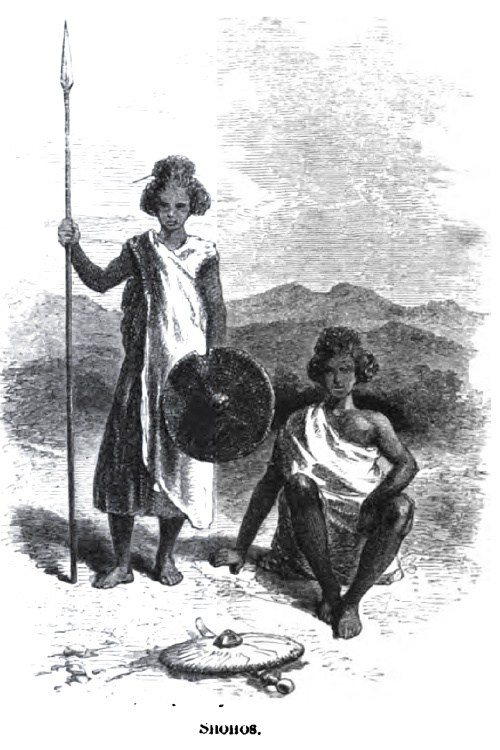 The Shohos are today known as the Danikil and are Arabs on the Horn of Africa. Parkyns really came to appreciate going barefoot. The road in many places reminded me of the ascent or descent of the pyramids of Gizeh, but was even more difficult, being literally a staircase, formed by enormous blocks of stone, with often a depth of four feet or more between each step. Had I been shod, instead of being barefoot, it would have been scarcely possible for me in many places to have reached the bottom without a fall. It was not till then that I thoroughly understood why the Abyssinians in general never wear shoes, and why those few who have borrowed from their neighbours on the Red Sea the custom of wearing sandals, should only use them in town, and immediately take them off when going on a journey. The fact is, that in a country abounding in rocks as this does, it would be dangerous to attempt to pass many places excepting barefoot; and it is moreover by far the most comfortable way of walking. I went four years barefoot, and must now confess that the compassion I used to feel for a beggar who had no shoes is much diminished, since I have come to know by experience that it is by far more comfortable to go without them after a very short practice. He also came to learn about just how adaptable going barefoot is. In answer to this remark some people have said that it appeared I did not take into consideration the difference of climate, and how terribly persons without shoes must suffer in an English winter. This is the greatest possible mistake; the less confined the foot, the freer the circulation of the blood; and, besides, the foot soon becomes inured to any temperature. I have walked for hours on stones, and even earth, that I could not have borne my hand on for a second, without feeling the heat oppressive to my feet. Oh, what a good law it would be that should forbid the use of shoes or stockings all over the world! We should then bid adieu to corns, chilblains, sore feet from walking, and, of more importance than all the dangerous consequences of sitting with wet feet. 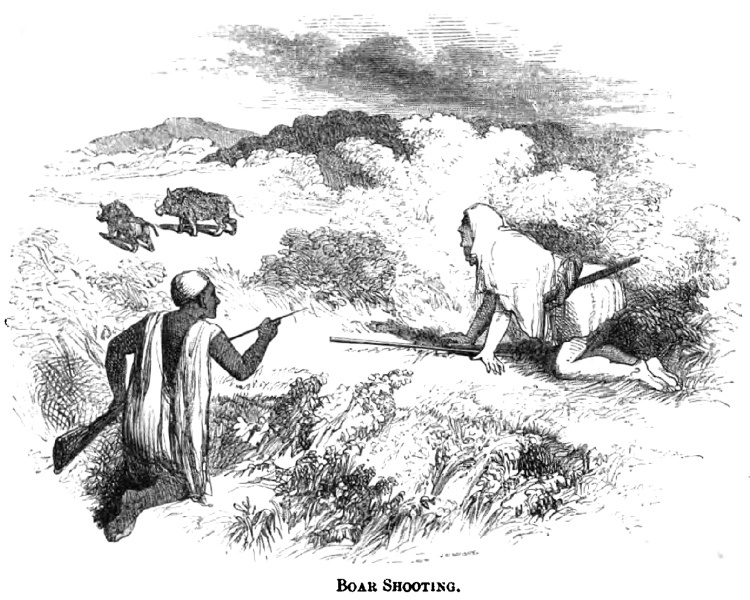 This picture is of Parkyns and a companion hunting some pigs. You can see that Parkyns (the white guy!) really had adopted the dress and bare feet of the natives. Going barefoot, and seeing so many naturally barefoot feet, Parkyns made some other astute observations. The shape of our feet is very different from what Nature intended it to be. The great toe, instead of being the longest, should be shorter than, or at most equal to, the one next it. Compare a modern European’s feet with those of a statue of one of the ancient masters, and the difference will be at once perceptible. Similar arguments might be used against confining other parts of the body by tight dress, and against the false taste for small waists, which exhibit a most disagreeably abrupt angle at the hip-bone, very different from the line of beauty as described by Hogarth, and preventing European women from ever retaining the beautiful figure which Nature gave them, and which we see so truly drawn by some of the ancient sculptors. Figures like the Hebe or the Venus di Medici are now only to be met with in the East. It should be mentioned that these last remarks are more the result of conversations I have had on the subject with artists than of my own personal observation. On this account I offer them with more confidence than I should otherwise have done; though, indeed, I can scarcely imagine that any one will differ from them in whose cranium is developed the organ of form, or who has made drawing the human figure a study. At one point, he attended a dance in western Eritrea for St. Michael’s Day. (Yes, they were Catholic there.) And of course, Holy Men go barefoot. But then, I guess everybody there goes barefoot, so it’s not such a big deal for Holy Men to do so. It’s just around here it seems to be a big deal. So, here’s just another example of how, 150 years ago, people regularly went barefoot throughout the world (and were not kicked out of locations for doing so). It was just another case of: I’ll be seein’ ya barefoot. 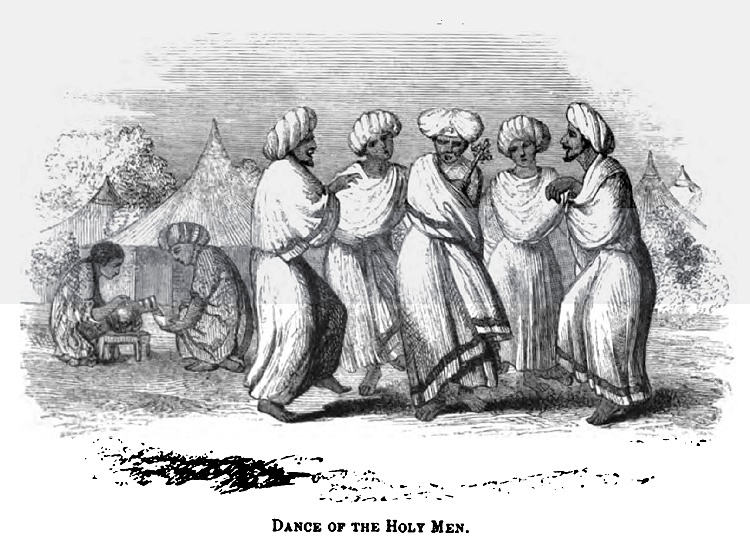 While Christian, I doubt the dancing holy men were catholic. More likely, they were Copts, a group neither Catholic nor Eastern Orthodox, but far older than either. My pastor (Methdist) was a delegate to the National Council of Churches when the Coptic Church became members of that ecumenical body. A reporter asked him to point out one for an interview. They were wearing ecclesiastical garb, so readily identifiable, but he could see none. “That’s the way it goes, you can never find a Copt when you need one.” He said no reporter bothered him for the rest of the conference. And you thought your Abyssinia pun was bad. Good point. When reading that part of the book, it just wasn’t always clear what was going on. Heck, I could never even tell where he was, since nearly every place name he ever gave came up Google-empty. I have figured that he was along the Mereb (or Gash) River, in the area that now forms the border between Ethiopia and Eritrea. Regarding the churches, I now see that there is an Ethiopian Orthodox Church and an Eritrean Orthodox Church (both varieties of “Oriental Orthodox Church”. My source says that Coptic is another variety. Final answer: I’m still not sure which kind of church, as you say, definitely not Catholic. Sounds like a pleasantly challenging destination for an extended barefoot trekking holiday!